It was recognizable as a line on the surface. 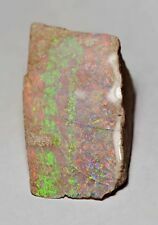 When split one or two surfaces with opal could be seen, similar to Queensland boulder opal. Although we do our best to maintain original colours in the opal, screen variations may affect the appearance. This Opal Doublet = A thin slice of natural crystal opal from South Australia glued to a Queensland Australian Boulder Opal back to simulate natural gem Boulder Opal. · Gem: One Natural Boulder Doublet Opal Stone Gem Quality: A . Solid natural, genuine Australian opals from Australia, NOT synthetic, not a doublet or triplet. STONE TYPE : SOLID, NATURAL AUSTRALIAN BOULDER OPAL. SOLID, NATURAL GENUINE BOULDER OPAL MATRIX FROM QUEENSLAND, AUSTRALIA …. Origin Winton, Queensland, Australia. Natural solid boulder opal loose stone 17.15ct - YouTube. About Boulder Opal:Boulder opals which are mined only in central Queensland Australia, are fund in ironstone. Weight: 26 Carats. All opal is best viewed in full sunlight to truly show its colours. All photos are taken under bright light and while the stone is wet to show the color in the piece. Origin Winton, Queensland, Australia. About Boulder Opal:Boulder opals which are mined only in central Queensland Australia, are fund in ironstone. Natural solid boulder opal loose stone 4.80ct - YouTube. Natural solid boulder opal loose stone 6.93ct - YouTube. About Boulder Opal:Boulder opals which are mined only in central Queensland Australia, are fund in ironstone. DETAILS: No1049 Natural solid boulder opal loose stone6.93ct. Natural solid boulder opal loose stone 5.26ct - YouTube. Natural solid boulder opal loose stone 5.26ct. Natural solid boulder opal. About Boulder Opal:Boulder opals which are mined only in central Queensland Australia, are fund in ironstone. Origin Winton, Queensland, Australia. About Boulder Opal:Boulder opals which are mined only in central Queensland Australia, are fund in ironstone. Natural solid boulder opal loose stone 6.95ct - YouTube. Origin Winton, Queensland, Australia. Natural solid boulder opal loose stone 3.13ct - YouTube. About Boulder Opal:Boulder opals which are mined only in central Queensland Australia, are fund in ironstone. Origin Winton, Queensland, Australia. About Boulder Opal:Boulder opals which are mined only in central Queensland Australia, are fund in ironstone. DETAILS: No0992 Natural solid boulder opal loose stonepair 43.51ct. Origin Winton, Queensland, Australia. About Boulder Opal:Boulder opals which are mined only in central Queensland Australia, are fund in ironstone. Natural solid boulder opal loose stone 2.19ct - YouTube. Natural solid boulder opal. About Boulder Opal:Boulder opals which are mined only in central Queensland Australia, are fund in ironstone. All opal sold here is genuine solid Australian opals. About opal colours photographs:The colours of an opal shown in photographs vary in different lighting and. About Boulder Opal:Boulder opals which are mined only in central Queensland Australia, are fund in ironstone. Stone Natural solid boulder opal. All opal sold here is genuine solid Australian opals. About opal colours photographs:The colours of an opal shown in photographs vary in different lighting and. BIRO OPAL to your Favourites ! BIRO OPAL to your Favorites ! – Fb : Biro Opal –. SOLID, NATURAL GENUINE BOULDER OPAL FROM QUEENSLAND, AUSTRALIA …. Solid natural, genuine Australian opals from Australia, NOT synthetic, not a doublet or triplet. Origin Winton, Queensland, Australia. About Boulder Opal:Boulder opals which are mined only in central Queensland Australia, are fund in ironstone. Natural solid boulder opal loose stone 15.72ct - YouTube. Solid boulder opal loose stone 4.82ct - YouTube. Solid boulder opal loose stone 4.82ct. Natural solid boulder opal. About Boulder Opal:Boulder opals which are mined only in central Queensland Australia, are fund in ironstone. All opal is best viewed in full sunlight to truly show its colours. Weight: 146 Carats. The first two photos show the polished side and the following photos show the unpolished wet side. All photos are taken under bright light to show the color in the piece. Natural solid boulder opal loose stone 11.47ct - YouTube. About Boulder Opal:Boulder opals which are mined only in central Queensland Australia, are fund in ironstone. DETAILS: No1012 Natural solid boulder opal loose stone11.47ct. About Boulder Opal: Boulder opals which are mined only in central Queensland Australia, are fund in ironstone. Natural solid boulder opal loose stone 4.38ct - YouTube. DETAILS: No1035 Natural solid boulder opal loose stone4.38ct. About Boulder Opal:Boulder opals which are mined only in central Queensland Australia, are fund in ironstone. Natural solid boulder opal loose stone 10.37ct - YouTube. DETAILS: No0958 Natural solid boulder opal loose stone10.37ct. Natural boulder opal loose stone 11.89ct - YouTube. Natural solid boulder opal loose stone 11.89ct. Natural solid boulder opal. About Boulder Opal:Boulder opals which are mined only in central Queensland Australia, are fund in ironstone. About Boulder Opal:Boulder opals which are mined only in central Queensland Australia, are fund in ironstone. Natural solid boulder opal loose stone 0.76ct - YouTube. DETAILS: No1062 Natural solid boulder opal loose stone0.76ct. Natural solid boulder opal loose stone 2.31ct - YouTube. Natural solid boulder opal loose stone 2.31ct. Natural solid boulder opal. About Boulder Opal:Boulder opals which are mined only in central Queensland Australia, are fund in ironstone. Opal Rough, Natural Opal, Opal Lapidary,Boulder Opal, Australian Opal 88.98 ct.
Australian Natural Rough 88.98 ct Boulder Opal. Weight : 88.98 ct. Origin Winton, Queensland, Australia. About Boulder Opal:Boulder opals which are mined only in central Queensland Australia, are fund in ironstone. Natural solid boulder opal loose stone 6.98ct - YouTube. Natural solid boulder opal loose stone 2.05ct - YouTube. Natural solid boulder opal loose stone 2.05ct. Natural solid boulder opal. About Boulder Opal:Boulder opals which are mined only in central Queensland Australia, are fund in ironstone. Origin Winton, Queensland, Australia. About Boulder Opal:Boulder opals which are mined only in central Queensland Australia, are fund in ironstone. Natural solid boulder opal loose stone 7.17ct - YouTube. Weight: 49 Carats. All opal is best viewed in full sunlight to truly show its colours. The first two photos show the polished side and the following photos show the unpolished wet side. All photos are taken under bright light to show the color in the piece. Natural solid boulder opal loose stone 1.86ct - YouTube. Natural solid boulder opal loose stone 1.86ct. Natural solid boulder opal. About Boulder Opal:Boulder opals which are mined only in central Queensland Australia, are fund in ironstone. Solid boulder opal loose stones 5.12ct set of 2 - YouTube. Solid boulder opal loose stones 5.12ct set of 2. Natural solid boulder opals. About Boulder Opal:Boulder opals which are mined only in central Queensland Australia, are fund in ironstone. Origin Winton, Queensland, Australia. About Boulder Opal:Boulder opals which are mined only in central Queensland Australia, are fund in ironstone. Natural solid boulder opal loose stone 4.27ct - YouTube. Origin Winton, Queensland, Australia. About Boulder Opal:Boulder opals which are mined only in central Queensland Australia, are fund in ironstone. Natural solid boulder opal loose stone 27.32ct - YouTube. Shape: Rough, Boulder Raw. Gem Type: OPAL. SKU/Product ID: LBO4. Country of Origin:Australia. Modified: NO. Shape: Rough. SKU/Product ID:NBO9. Country of Origin: AUSTRALIA. Modified: NO. Natural solid boulder opal loose 31.60ct - YouTube. Natural solid boulder opal loose stone. Natural solid boulder opal. About Boulder Opal:Boulder opals which are mined only in central Queensland Australia, are fund in ironstone. Natural solid boulder opal loose stone 6.40ct - YouTube. Natural solid boulder opal loose stone 6.40ct. Natural solid boulder opal. About Boulder Opal:Boulder opals which are mined only in central Queensland Australia, are fund in ironstone. Origin Winton, Queensland, Australia. Natural solid boulder opal loose stone 7.88ct - YouTube. About Boulder Opal: Boulder opals which are mined only in central Queensland Australia, are fund in ironstone. Weight: 164 Carats. All opal is best viewed in full sunlight to truly show its colours. The first two photos show the polished side and the following photos show the unpolished wet side. All photos are taken under bright light to show the color in the piece. SKU/Product ID: LBO103. Shape: Rough. Country of Origin: Australia. Origin Koroit, Queensland, Australia. Natural solid boulder opal loose stone 1.94ct - YouTube. About Boulder Opal:Boulder opals which are mined only in central Queensland Australia, are fund in ironstone. Weight: 108cts. item#: SBO107. Beautiful Queensland Australian Boulder Opal Nugget! Brought to you by "The Gem Federated Group!". Australian Natural Rough 15.89 ct Boulder Opal. Weight : 15.89 ct. Shape: Rough, Boulder. GemType: Opal. SKU/Product ID: lbo15. Country of Origin: AUSTRALIA. Modified: NO. Transparency: OPAQUE. Specific Gravity: 2.2. Large Chunk Queensland Australian Boulder opal "Feel free to make Offers!"